That is one of the many stunned reactions from within the Mark Keppel athletics community, as they search for words to describe the unimaginable. Monday was supposed to be a joyous occasion, with a team from Tokyo coming to play an exhibition game against the Lady Aztecs. 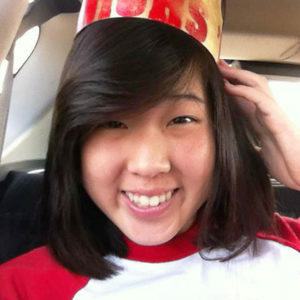 Esther Suen is seen in a photo from a memorial page setup in her honor on Facebook. The game was canceled, along with many other activities at Keppel, after senior Esther Yieng Suen was killed in a hiking accident Friday. Suen, 17, was one of four Keppel seniors on the day trip in the Eaton Canyon area of Pasadena. Attempting to climb to one of the picturesque waterfalls in the canyon, she and another student fell some 200 feet to the rocks below. The Los Angeles County Coroner’s office said Suen suffered a fatal head injury and was pronounced dead at the scene. Another student, identified as an 18-year-old male, sustained a dislocated shoulder. The Rafu has learned that the group decided to climb to one of two waterfalls in the area, which is discouraged by the Los Angeles County Parks Department. After deciding the climb was too dangerous, the group began to climb down and fell during their descent. There have been at least three hiking-related deaths in Eaton Canyon since last August. Members of the Keppel girls’ basketball team were very close to Suen, and are said to be devastated. A member of the school’s diving team, she was reportedly planning to join a gathering at one player’s home to do some baking after the hiking trip. Yuko Takagi, head coach of the Yakumo Academy, was said to be very excited about the goodwill game, and had called her current team the best she’s had in over 25 years. Keppel, under the guidance of Coach Joe Kikuchi, enjoyed a very successful season, capturing the Almont League Championship with a 10-0 record and advancing to the CIF Division 2AA Southern Section Semifinals and the second round of the CIF Division II State Championships. Keppel has counselors on campus today and has scheduled a memorial service for Suen late this afternoon at school.